As one of the most important churches of the Catholic faith and the second-largest church in the world, Saint Peter's Basilica is one of the top sights to see in Vatican City and in all of Rome. With its impressive dome, the focal point of Rome's cityscape, and its ornate interior, Saint Peter's is, without a doubt, pleasing to the eye. For many, it is the highlight of a visit to Rome, and with good reason. Both the exterior and interior of the basilica were designed to overwhelm, and they succeed in doing so. The massive, oval-shaped Piazza San Pietro (Saint Peter's Square) serves as a monumental entrance to the vast basilica, with its soaring ceilings and intricately detailed marble, stone, mosaic and gilded ornamentation at every turn. The church draws millions of visitors each year, including those who are drawn for religious reasons as well as those interested in its historical, artistic and architectural significance. It is also the resting place of many former popes including John Paul II and Saint Peter, Christendom's first pope and the founder of the Catholic Church. Pilgrims also flock to Saint Peter's during religious holidays, such as Christmas and Easter, as the pope performs special masses at the basilica during these times. He gives blessings at Christmas and Easter, as well as his first blessing when he is elected, from the balcony of the central window above the entrances to the atrium. Christian theology holds that Peter was a fisherman from Galilee who became one of the 12 Apostles of Christ and continued to promote the teachings of Jesus after his death by crucifixion. Peter, along with the Apostle Paul, journeyed to Rome and built up a congregation of followers of Christ. Fearing persecution for his teachings, Peter allegedly fled Rome, only to encounter a vision of Jesus as he was on his way out of the city. This convinced him to turn back to Rome and face his inevitable martyrdom. Both Peter and Paul were executed by order of Roman Emperor Nero, sometime after the Great Fire of Rome in 64 AD but before Nero's own death by suicide in 68 AD. Saint Peter was crucified upside down, allegedly at his own request. Peter was martyred at the Circus of Nero, a site for tournaments and games on the western side of the Tiber River. He was buried nearby, in a cemetery used for Christian martyrs. His tomb soon became a site of veneration, with other Christian tombs built around it, as the faithful sought to be interred near Saint Peter. For Catholics, Peter's role as an Apostle, and his teachings and martyrdom in Rome earned him the title of the first Bishop of Rome or the first Catholic Pope. In the 4th century, Emperor Constantine, Rome's first Christian emperor, oversaw the construction of a basilica on the burial site of Saint Peter. Now referred to as Old Saint Peter's Basilica, this church stood for more than 1,000 years and was the burial place of almost every pope, from Peter himself through to the popes of the 1400s. In a dire state of disrepair by the 15th century, the basilica underwent a series of modifications under several different popes. When Pope Julius II, who reigned from 1503 to 1513, took oversight of renovation, he aimed to create the greatest church in all of Christendom. He had the original 4th-century church destroyed and ordered the construction of an ambitious, magnificent new basilica in its place. Bramante made the first plans for the main dome of Saint Peter's. Inspired by the dome of the Pantheon, his plan called for a Greek cross (with 4 arms of equal length) supporting a central dome. After Julius II died in 1513, artist Raphael was put in charge of the design. Using the form of the Latin cross, his plans extended the nave (the part where worshipers gather) and added small chapels on either side of it. Raphael died in 1520, and various conflicts in Rome and the Italian peninsula stalled progress on the basilica. Finally, in 1547, Pope Paul III installed Michelangelo, already considered a master architect and artist, to complete the project. His design used Bramante's original Greek cross plan and includes the massive dome, which remains the largest in the world and one of the greatest achievements of Renaissance architecture. Michelangelo died in 1564, his project only partially complete. Subsequent architects honored his designs to complete the dome. The elongated nave, the facade and the portico (the vaulted entrance) were the contributions of Carlo Maderno, under the direction of Pope Paul V. Construction of "New Saint Peter's"—the basilica we see today—was completed in 1626, more than 120 years after its outset. Is Saint Peter's the Most Important Church in Rome? While many think of Saint Peter's as the mother church of Catholicism, that distinction actually belongs to Saint John Lateran (Basilica di San Giovanni in Laterano), the cathedral of the Bishop of Rome (the Pope) and therefore the most hallowed church for Roman Catholics. Yet because of its history, relics, proximity to the Papal residence in Vatican City and its sheer size, Saint Peter's is the church that attracts droves of tourists and faithful. In addition to Saint Peter's and Saint John Lateran, the other 2 Papal Churches in Rome are the Basilica of Santa Maria Maggiore and Saint Paul Outside the Walls. The Nave. Upon entering the basilica, you'll be astounded by the dimensions of the nave, the long, main part of the cathedral where worshipers are seated during mass. It's more than 600 feet long (nearly the length of 2 soccer fields) and almost 90 feet wide, and richly embellished on every surface. The Pieta. Rivaling David as Michelangelo's best-known sculpture, this poignant portrayal of Mary holding the body of the dead Christ is in the first chapel on the right, as you enter the basilica. The artist carved the work when he was just 24 years old. Bronze Statue of Saint Peter. Near the right pier or massive support for the transept, stands a bronze statue of Saint Peter, thought to date to the 1200s. His right foot has been worn shiny and smooth by centuries of worshipers who rub or even kiss it as they pass. The Baldacchino. The massive canopy, the work of sculptor and architect Gian Lorenzo Bernini, was crafted from bronze taken from the Pantheon. 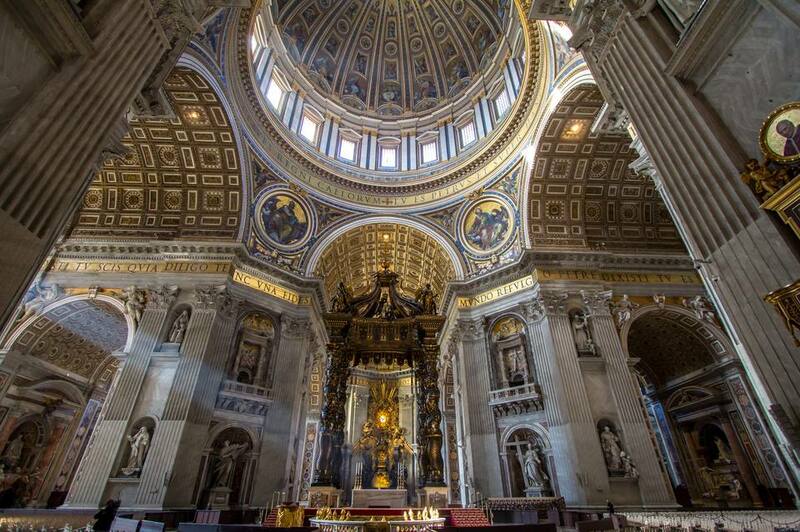 It covers the basilica's main altar, where only the pope is permitted to say mass. The altar is built over the tomb of Saint Peter and is the symbolic and spiritual heart of the basilica. The Dome. Ringed by 16 windows and inscribed with letters more than 6 feet tall, Michelangelo's dome, which he never saw completed, is nearly 400 feet tall from its floor to its lantern, or cupola. Monument to Alexander VII. Of the many magnificent papal tombs in Saint Peter's, Bernini's monument to Pope Alexander VII is perhaps the most haunting. A pious pope prays while a skeletal figure of Death emerges from beneath a blanket carved from jasper stone. He holds an hourglass, as a reminder to the pope (and to onlookers) that his time has passed. Sacristy and Treasury Museum. To view some of the many treasures of the Vatican, including crosses, papal vestments (clothing), jewels and reliquaries, visit the Sacristy and Treasury Museum. It costs 5 euro for adults and 3 euro for children 12 and under. Vatican Grottoes. As you exit the basilica, follow signs for the Vatican Grottoes and Cupola (dome). The underground grottoes contain the tombs of dozens of popes, including John Paul II. An elaborate gilded altar is built over what is considered to be the tomb of Saint Peter. The main altar and Baldacchino are directly above this spot. Entrance to the grottoes is free. Climbing to the Cupola. If you're feeling energetic, you can climb the 551 steps (or just 320 if you take the elevator part way) to the cupola, or the top of Saint Peter's dome, to be rewarded with stunning views of Rome. It costs 10 euro if you take the elevator or 8 euro if you climb the entire way. Even when there aren't papal audiences or other special events happening, the basilica is almost always crowded. The best time to visit without crowds is usually in the early morning, from 7 to 9 am. Information: The basilica opens at 7 am and closes at 7 pm in the summer and 6:30 pm in the winter. Before you go, it's a good idea to check the Saint Peter's Basilica website for current hours and other information. Location: Piazza San Pietro (Saint Peter's Square). To arrive by public transportation, take the Metropolitana Line A to the Ottaviano “San Pietro” stop. Admission: It's free to enter the basilica and the grottoes, with fees (see above) for the sacristy and treasury museum, and the climb to the cupola. The cupola is open from 7:30 am to 6 pm April to September, and to 5:00 pm October to March. The sacristy and treasury museum are open from 9 am to 6:15 pm April to September and to 5:15 pm October to March. Dress code: Visitors who are not dressed in the appropriate attire will not be allowed entry into the basilica. Refrain from wearing shorts, short skirts, or sleeveless shirts when you're visiting Saint Peter's and/or bring a shawl or other cover-up. Those rules go for all visitors, male or female. Visitors often visit Saint Peter's Basilica and the Vatican Museums, including the Sistine Chapel, on the same day. Castel Sant'Angelo, at various times in history a mausoleum, a fortress, a prison and now, a museum, is also close to Vatican City.